The new Little Devil is a pipe inspired by the mini pipe that was smoked by Kevin Costner in the History Channel TV mini-series "The Hatfields & the McCoys". Costner portrayed the patriarch of the Hatfield family, William Anderson "Devil Anse" Hatfield, and in his portrayal Costner's character smoked a small pipe that has now been nicknamed the "Devil Anse". 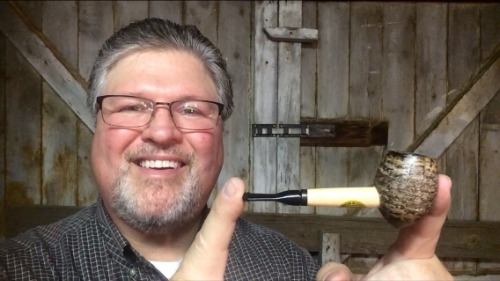 This is a small corn cob version of that pipe features a genuine hardwood bottom to prevent premature burn-through! It is only available in the straight, yet canted shape seen, and is an unfiltered pipe. The replacement bit for this pipe is a Royal bit, but this pipe will also accept the "Slim" bit if a longer pipe is desired.